Moving home is both exciting and stressful. After all it’s a new chapter in your life; but while you’re excited to be living in different surroundings, at the same time there is a lot of work to do to ensure that you get back your bond money on your current rental. Bond money refers to the deposit that was handed over to your landlord at the beginning of your lease contract. Once it ends, you need to ensure that the property is in the same condition as when you took it over. In other words, you need to make sure it’s clean, tidy, and ready for new tenants to move in. Many people make the mistake of thinking that they can do the cleaning themselves and get back their bond money. It’s not as easy as it sounds. Most of us give our homes a quick dust and polish every week, but when it comes to cleaning a property thoroughly from top to bottom, you’ll be surprised at how long it takes and how exhausted it makes you feel. Combined with packing up your possessions, organising a removal, and holding down your day job, your best option really is to hire a professional bond cleaner. Why hire a bond cleaner? Professional bond cleaners can make your property look like new and takes away the possibility that you may not get back your bond money. 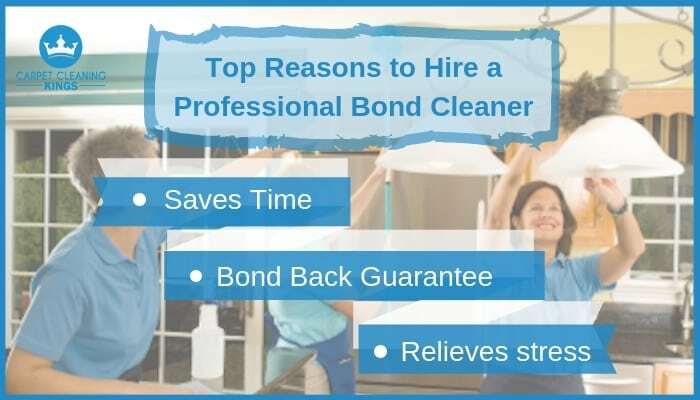 There are other advantages to hiring a bond cleaner too, so let’s take a closer look. Professional bond cleaners are experienced. After all, it’s what they do most days of the week. They know how to clean and they know what areas need special attention. Armed with the right tools and cleaning materials, they can clean a property from top to bottom leaving it sparkling clean – just as when you first moved in. Moving out requires a lot of organisation, and you’re sure to have a long tick list of jobs to complete. Cleaning your property is just one more task that you could really do without. Hiring a professional bond cleaner gives you back much needed time, allowing you to concentrate on ticking off other jobs on your list. Cleaning an entire property without any help can be incredibly stressful. It’s physically tiring, takes an absolute age, and despite your best efforts, it’s lacking that professionally cleaned feel and appearance. A reputable and experienced bond cleaning company will give you a guarantee that your bond money will be returned to you. They should detail all of the cleaning tasks that they’ll be undertaking. Wiping and clean lights, ceiling fans, vents etc. Bond cleaning shouldn’t be taken lightly – it’s an important task which also creates a good impression for the landlord, and gives you peace of mind that you will get your bond money back. If you’re in need of a professional bond cleaner give Carpet Cleaning Kings a call on 1300 7000 75. We’ve been in the cleaning industry for decades and are reliable, trustworthy, and good at what we do!